While most of my buddies are out partying, I prefer to spend New Year’s Eve in a tree stand. You see, being 28 and single gives me the freedom to call bowhunting a very important part of my life. So I couldn’t think of a better place to be than with my Dad hunting the last day of 2008. Little did I know, this New Years’ Eve would be my most memorable to date. Every year my father and I head to Illinois to hunt a friend’s property between Christmas and New Years.’ He owns a large tract of land that has been practicing QDM for fifteen years. The goal of this late season hunt is to harvest mature does - a job I take seriously. Late season does are no easy target and we’re finding an added benefit to sitting in the bitter cold during these hunts; it’s bringing us closer and closer to big, mature bucks. In fact, the colder and nastier the weather is, the better it is for a crack at a true trophy. 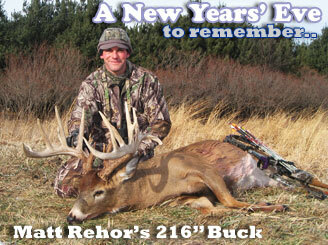 The buck I got New Years Eve has a special story that goes beyond just killing a magnificent trophy. It’s a story I want to share with everyone. My story begins in March of 2008. I received terrible news of the passing of one of my closest hunting companions. His death has left me with many unanswered questions. Healing from this tragedy has been difficult for me. To be honest, the anger stage would not go away. My friend Myles was a true outdoorsman. He could trap, hunt, and fish better than most - even the most seasoned veteran. From the first time we met, I knew this guy was someone I wanted to be around. I had always considered myself an outdoorsman, but Myles personified it. Since his death my time afield has been filled more with frustration than peace. On New Years’ Eve day, before my afternoon hunt, I visited with Myles’ best friend. We had a cup of coffee, got caught up, and watched a memorial DVD that had been made in Myles’ honor. The DVD was filled with photos from the past few years, memorable hunting trips, and his successes in the field. As I pulled on to the main road on my way back to the hunting property I just couldn't shake the feeling that Myles was with me. Even getting dressed to head out I just couldn’t help but think there was something special about this hunt. The evening would be spectacular. My father and I were hunting a few hundred yards apart. As we walked to our stands I remember him talking but I couldn’t tell you a word he said. All I could think about was Myles. Once in the stand, I reminisced about all the great times we had hunting together and how I missed my friend. Light was fading fast. I had just a few minutes of shooting light left when I heard the sound of deer approaching my treestand. This part of the property always holds some nice bucks and I had been waiting for a northwest wind to hunt here. I had killed some does earlier in the trip so I decided I would wait and see if this group had a mature buck in it. The does had a free pass this evening. A big doe lead a small pack of deer through the shooting lanes we had cut and the stage was set for a nice buck to walk by. My plan seemed to be working; I could hear the slow pace of a big deer coming down the same trail. I had two lanes to shoot. The first lane would let me check him over and if he was big enough, I’d take the shot in the second. As the buck approached the first lane I could feel that Myles was right over my shoulder. As the deer walked through the first lane I knew immediately not only was the buck a shooter, he was also a giant! He stepped behind a tree as I drew my bow. Now at full draw, he stepped into the second lane and stopped. I had just enough of his vitals showing. I put the pin right behind his shoulder and sent my Muzzy Broadhead through his chest. By his reaction, I knew the shot was perfect! He ran like a freight train out into the field and crashed seventy-five yards away. A few seconds later I heard him take his last breath. Immediately I stood up, looked into the sky, raised my bow, and let some needed tears flow down my cheeks. These tears had been long overdue. My friend was with me that night, and this experience allowed me to move on. 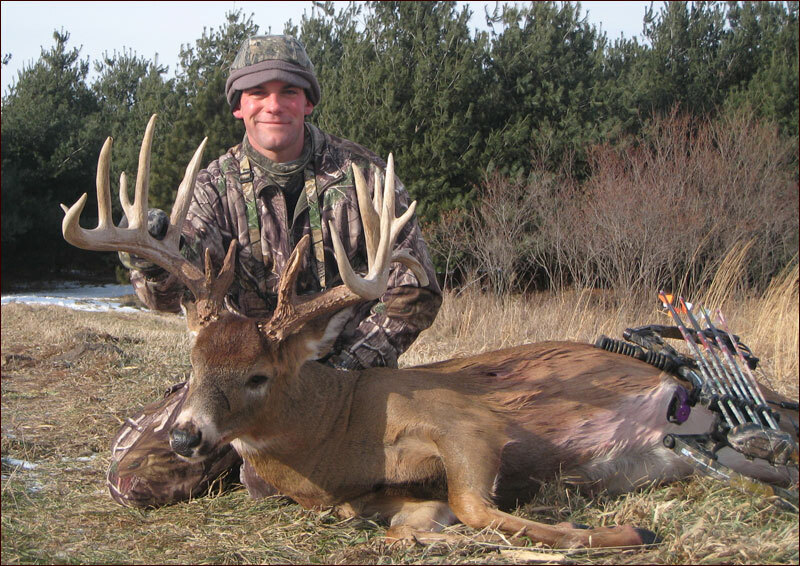 The buck could be categorized as a giant with an unofficial green, gross score of 216 inches non-typical and a net score around 206 Nontypical. Dressed weight was 205 pounds. But sharing this hunt with Myles, having him there, feeling my anger slip away, is what truly made this moment so special for me not the score. This experience is proof that those no longer with us physically, are not that far away. To all who have lost close hunting companions like I did, I hope my story helps you believe they are with us on every hunt. To my friend Myles McCoy who I know brought this deer and I together. To my Mom, who always supported our love for hunting. My father, who always took me with him as a young boy and introduced me to a sport that has helped me in all aspects of my life. To my wonderful girlfriend Kara, you undoubtedly understand me better than anyone else and encourage me to pursue my passion, I love you!! To Stella my beagle, for her time spent alone while I’ve been on stand, for still loving me, even when I yell when she chases deer while rabbit hunting. To Pat Lefemine, for being there with me and my dad when I found my first deer some 16 years ago! I will never forget that day! Finally, to all the Bowsite.com visitors, I hope, one day, you all get the chance to have a 200 incher cross your path. Best of luck to all in 2009. 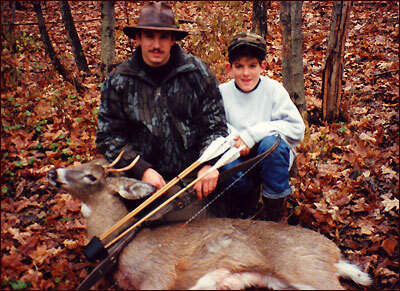 As you can see from this photo taken Matt and me way back in the 1980's, Matt's love of bowhunting and the outdoors has never wavered. I met him when he was 8 years old since he loved hanging out with his dad Charlie, and the other guys at their little deer camp in upstate New York. Regardless of how cold it was, Matt would patiently sit at the base of the tree while his dad hunted above. I remember the look on little Matt's face when he returned to the trailer to tell the story of one of the many deer his dad killed. A few years later I had the privilege of walking behind Matt and his dad after Matt arrowed his first deer with a perfect shot. As Matt grew older he became an accomplished bowhunter in his own right. Now, at 28 years old, he has 2 B&C and 4 P&Y bucks along with two species of caribou and a mule deer - all with a bow . Matt lives on Prudence Island, RI and is a carpenter by trade. He holds a BS in Wildlife Biology from Unity College in Maine and has over 100 Archery Big Game kills. He has Bowhunted in Maine, Rhode Island, New York, Pennsylvania, Maryland, Illinois, Alberta, Newfoundland and Alaska.